As you can imagine, I try to keep my good eye on the Toronto blogosphere. That's why I raised a Spockian eyebrow when I saw @TOblogwatch pop up on Twitter. 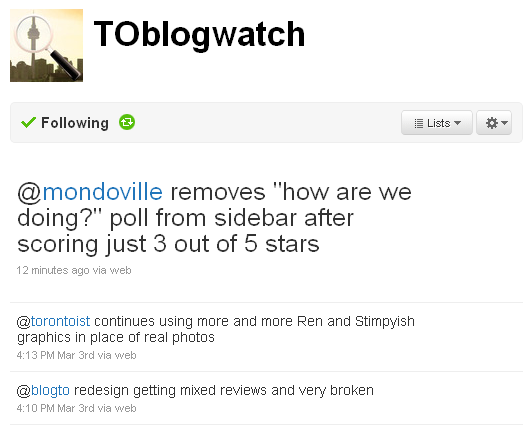 Toronto Blog Watch promises "Observations and commentary about the Toronto blogosphere." Sounds good to me! It looks like whoever is behind Toronto Blog Watch has actually started tweeting, as a few new tweets hit my TweetDeck this afternoon. This blog, by the way, has temporary immunity. Who's behind @TOblogwatch? Anyone have a clue? Does anyone care?